Air navigation maps and computers contain thousands of routes and waypoints (or fixes) to help pilots and air traffic controllers keep track of where the airplanes are. To make navigation and communication a little easier, most of the fixes are given names. Read on for some fun fix naming nonsense! 5 letter fixes displayed on an aircraft FMC. 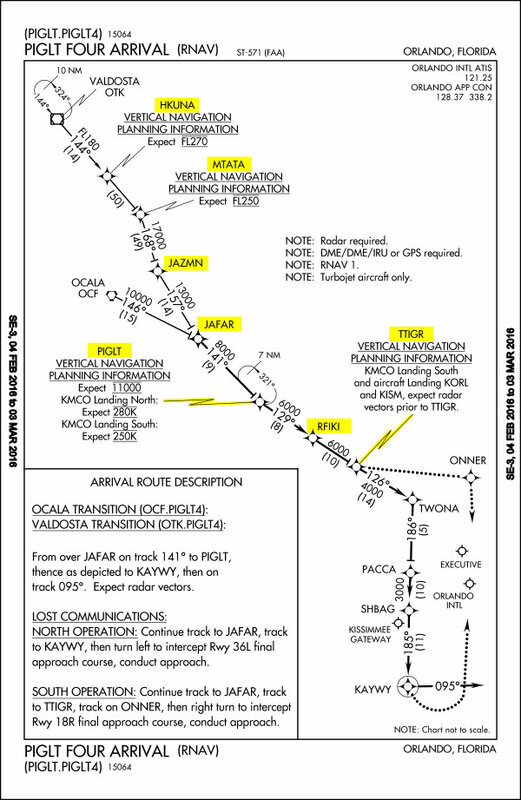 Navigation fixes are intersections or points along airways (highways in the sky) and airport arrival/departure procedures. Fixes are given five letter names (like NOISE and WEEDY) to make them easy for pilots and air traffic controllers to reference. Who names navigation fixes in the U.S.? When airways or procedures are being designed or modified, local FAA facility employees often recommend fix names. The FAA’s Office of Aeronautical Information Management (AIM) checks the names to make sure they are unique, pronounceable, and not obscene or controversial. Air traffic controllers have a pretty vivid imagination and a great sense of humor. There are some really clever fix names out there. It’s a small part of what makes aviation interesting and fun. Celebrities are often honored by having fixes named after them. With only five letters to work with, the spellings are often creative! Here are a few notable examples. The Tonight Show host, Jimmy Fallon has two fixes named in his honor, JIMEE and FALON. They are located on a low altitude airway (V312) between New York City and Atlantic City, New Jersey. Cleveland Cavaliers basketball star, LeBron James has his own intersection east of Cleveland’s Hopkins International airport. LEBRN intersection is the final fix airplanes fly over on the CHARDON arrival before landing in Cleveland. In 2010, during Donald Trump‘s popular TV show, The Apprentice, three fixes near Palm Beach, Florida were named after him: DONLD, TRMMP, and UFIRD (pronounced You-Fired). An arrival procedure, IVNKA ONE, was named after his daughter. There’s no doubt The Donald stirred up controversy during his presidential campaign. It’s rumored that some pilots were refusing to fly the IVNKA procedure or use the Trump fixes. In July of 2015, the FAA determined that Trump was too controversial and renamed all Trump-related navigation names. Sorry, Donald… You’re Fired! Sometimes a series of fix names will be used creatively to make a sentence. 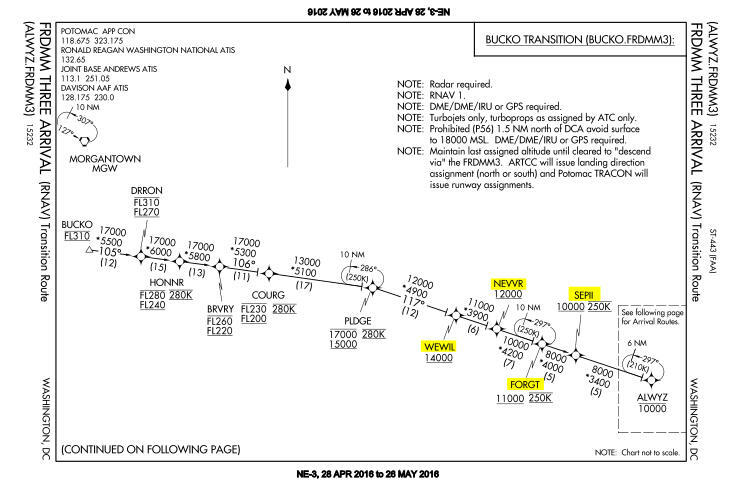 The BLAKA arrival procedure to Brisbane, Qld, Australia’s runway 19 reminds pilots that “LEAKY BOATS SINNK.” Gives flight crews something to ponder while flying over the water. For Disney fans, the Orlando, Florida area is filled with fun fix names. The PIGLT (Piglet) arrival to Orlando International can’t be beat! The PIGLT arrival includes three references to Disney’s “The Lion King”: HKUNA, MTATA (Hakuna Matata) and RFIKI (Rafiki). Disney’s Academy Award winning “Aladdin” is honored with the fixes JAZMN (Jasmine) and JAFAR. Finally, the arrival procedure’s namesake, PIGLT (Piglet), and his friend TTIGR (Tigger) from “Winnie The Pooh” are featured. One of the best tributes to Warner Bros. Cartoons can be found at the international airport in Portsmouth, New Hampshire. 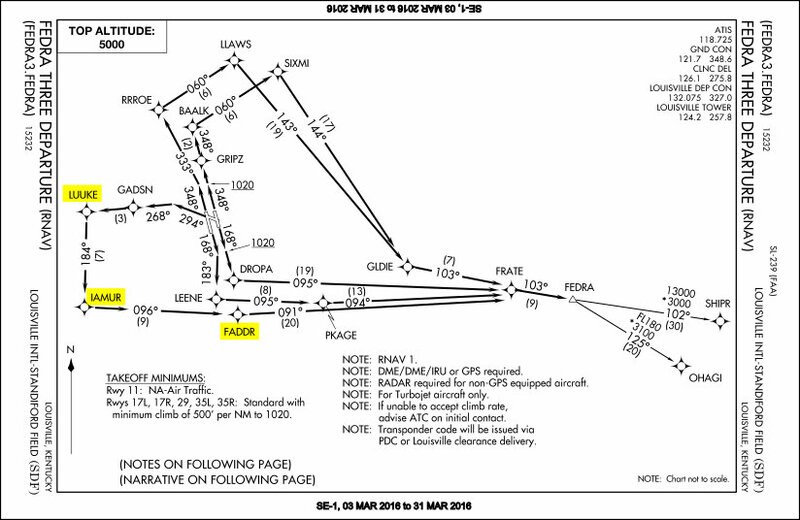 The instrument approach to runway 16 includes the fixes: ITAWT, ITAWA, PUDYE, TTATT, and IDEED. Louisville, Kentucky has plenty of fun fix names! My home base in Louisville, KY is famous for bourbon, baseball bats, college sports, and the biggest horse race of them all, the Kentucky Derby. The airspace around Louisville International’s Standiford Field (KSDF) is full of references to Louisville events, legends, landmarks, and more. BRBON – Bourbon. Kentucky’s most famous export. Just a few miles south of Louisville is the heart of Bourbon Country and home of Maker’s Mark bourbon. Nearby Samuels Field in Bardstown, Kentucky (named after Maker’s Mark founder Bill Samuels Sr.) has an approach procedure to runway 02 that features the famous beverage and references to bourbon production. Twin Spires of Churchill Downs. Star Wars references in Louisville? Die hard Star Wars fans will recognize the minor misquote. Lord Vader actually says “No, I am your father,” but I’ll let that slide. Kudos to the folks at the Louisville air traffic control facility for being super creative. With thousands of combinations in use, there’s bound to be a fix with your name on it (or close to it). Although, my last name, Hoke, is a four letter word 🙂 , I found a few five letter fixes that come close. Two of them sound like my family’s common nickname: HOKES, HOKEY, and HOKEE. Hey pilots, controllers, and AvGeeks, what are your favorite fix names? There are hundreds of good ones out there. Share your favorite fixes in the comments section below. Special thanks to Louisville air traffic controller Kristofer Violette for his invaluable input. 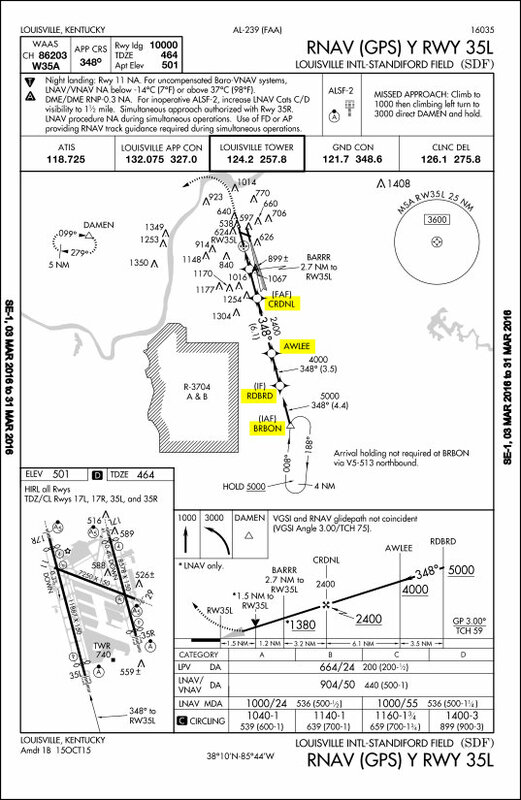 Terminal chart images obtained from FAA Digital Terminal Procedures Publication. 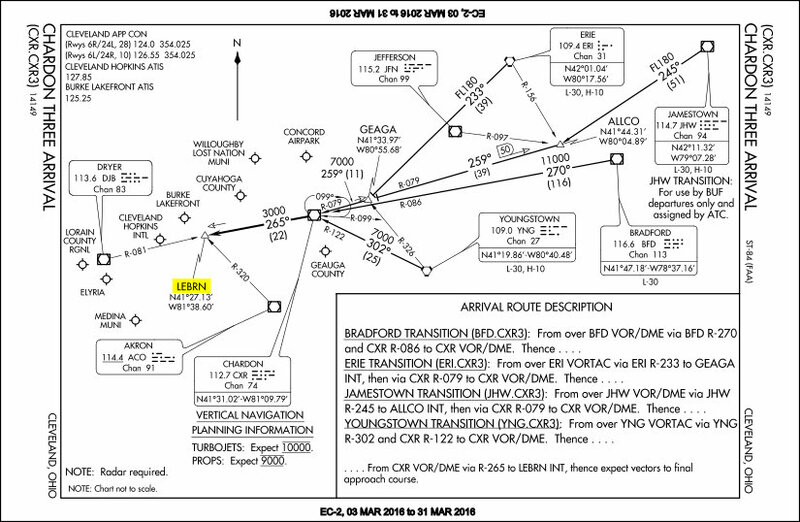 Enroute chart images obtained from FAA IFR Enroute Aeronautical Charts and Planning. Brisbane, Queensland, Australia BLAKA arrival chart obtained from Airservices Australia. Once again you deliver interesting, informative and amusing detail about keeping the big metal thing up in the air. AND not getting lost! It is a shame that you fly packages and not human cargo because I would feel very secure knowing that you are the command pilot on the aircraft I was flying in. Oh well, my loss. May God watch over you and your air crew when you slip your earthly bonds …. and frustrate ATC people! That’s very, very kind of you. Thank you for the comments (and THANKS for reading)! I’m flying to EWR tomorrow. I’ll flash the lights for you! Stuck it on the numbers with this one, Captain! Found fix DEREK in Louisina and THMAS was lurking in New Jersey. Great info, as always. Thanks, Derek! Glad you found “your” fixes. Of course, our flight proceeded without indecent. At this point, I’m just glad UPS doesn’t fly to Malpensa LIMC, or I would get really frustrated in the control tower! ? That’s funny! If I ever fly to Malpensa, I’ll try not to become irked. And again, a good interesting read. For Atlanta Hartsfield-Jackson International, there’s a weird sequence of fixes on the Dirty Three Arrival procedure: KILRR GAASS KLOWD REAKS. First time I saw this I thought, no, that can’t be right. That’s an awesome one, Jeff. Thanks for sharing!! Arrivals and Departures are updated, and/or renamed fairly often. It looks like KATL recently overhauled their arrivals. The SJC ROBIE THREE STAR has my Chief Pilot’s name on it, Robie. Not sure if he was involved with that one. 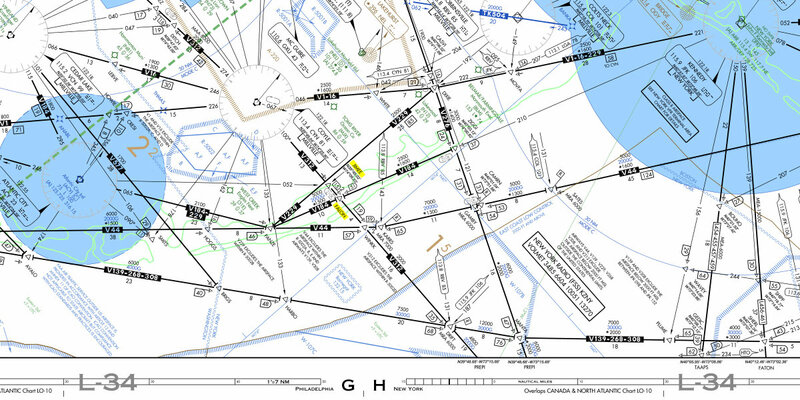 I skipped a couple because I don’t get the references, but it sounds like someone who dropped out of medical school decided to become a TERPS designer for the FAA. Sounds like a Deadhead got a job as a TERPS designer as well. Thanks for sharing. I always love a good Grateful Dead reference! First off your blog is very helpful, iv gained a lot of information off of it, But i do have one question that i cant find an answer too anywhere. When you flying, with someone else over a long distance flight do u ever talk or chat. Iv always wondered what pilots do when they have to sit for hours watching clouds go by? I really respect your profession and you helping people understand the importance of what you do. Once we are above 18,000 feet and cruising along for several hours, we are free to talk about anything we like. We discuss our families, vacations, schedules, company rumors, new procedures, you name it. Talking and sharing stories is one way we stay alert on long flights. When flying at night, I’m often looking out the window trying to spot satellites, meteors, and the Aurora Borealis over Canada (as my first officer stares at me like I’m nuts). Always love reading your stories! 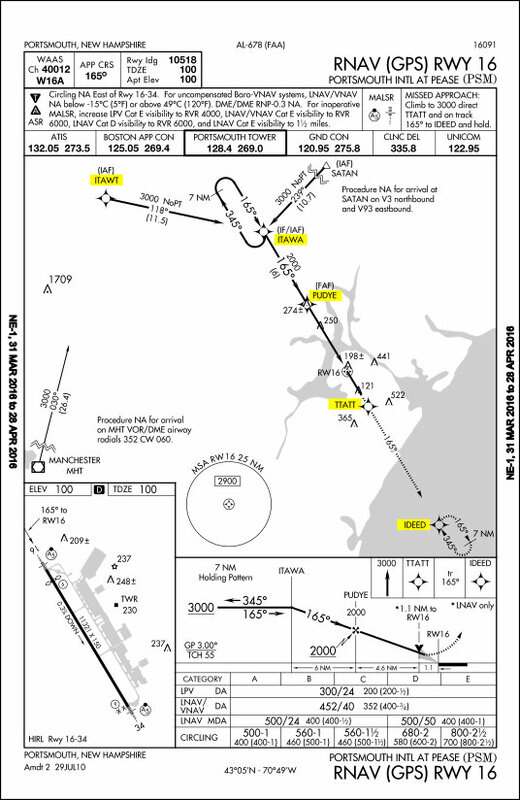 Check out KLOU RNAV approaches. I don’t have it in front of me. But one translates to “I’ve fallen and I can’t get up” and the other is “none of ya business” I saw it a couple days ago and almost fell out! Thanks for entertaining us. You’re absolutely right! 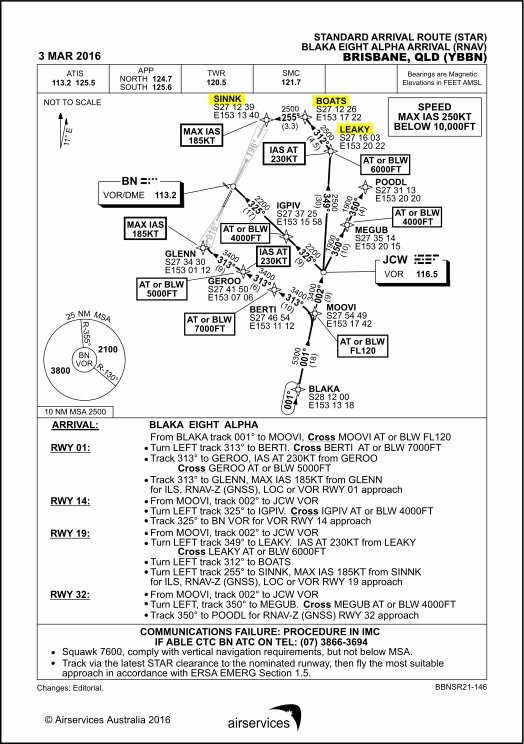 The GPS approach to KLOU runway 33 has: IFALN ANDYE CAANT GDUPP. 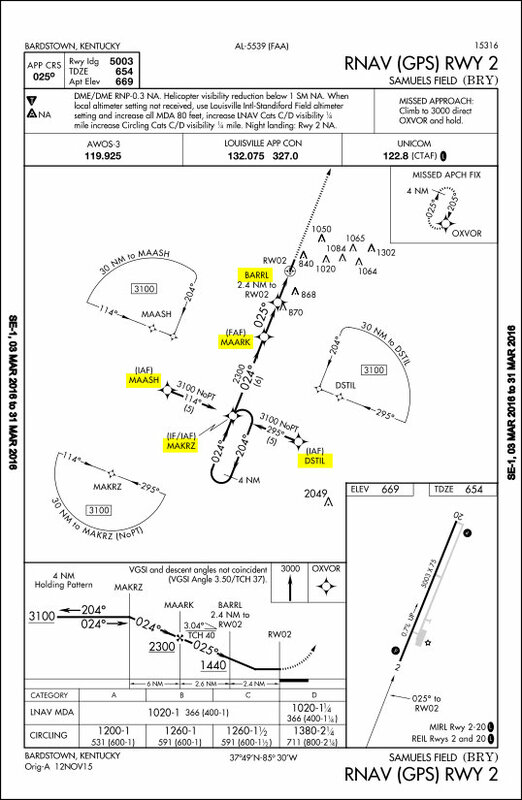 KLOU runway 24 has NUNYA BNNUS. Awesome fix names. In the article, I only scratched the surface of fun fix names in Louisville. There are many, many more! While I was reading I thought you will mention these ones too!! Those are great examples. As I pointed out in the article, fix names must have 5 letters to keep our computers happy. Here are the 5 letter spellings used to make those navigation fixes work. There are several other clever references in those two arrival procedures. Glad you enjoyed it! That’s cool that you found your name! Nashville has always been one of my favorite airports for fun fix names. Plenty of good ones. Thanks for sharing! this is a new subject for me. I’m not a pilot but I do have a pilot and my family. He is from Austin Texas and was wondering about the Star Wars points in Austin. Any idea why? Austin has some good ones! I took a quick look and found: SSOLO, VADRR, JEDYE, WINDU… Another funny one I found was SMRFF (not Star Wars, but still a good one). The most likely reason is the local controllers or ATC supervisors are Star Wars fans! When arrival and departure procedures are designed or updated, the local staff gets first shot at naming the fixes. WINDU is a named transition for SEWZY FOUR, VADRR is the split between the 17s and 35s. 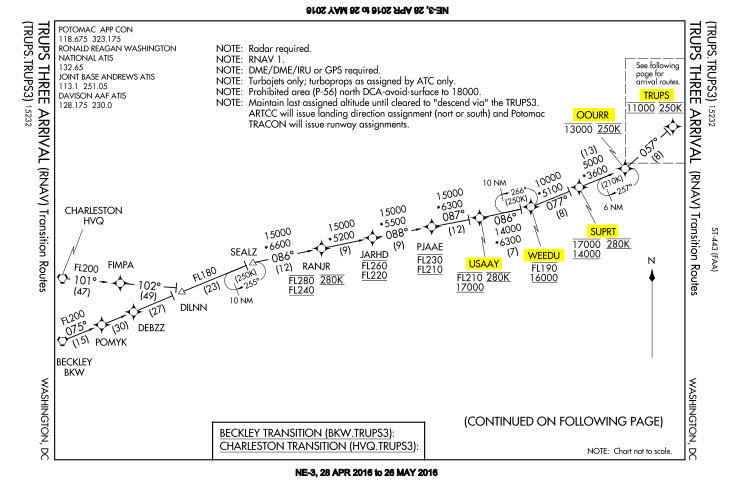 amd JEDYE is the arrival point where you transition to ATC for the active 17 approach, if I remember correctly. Dear Ken Hoke, And if you ever wondered where Waldo is, he’s at 44° 44′ 30.8200″ N x 122° 02′ 07.3200″ W at 3471 ft. MSL in Oregon. Where else would he be! Bob. Sonoma County Airport (Charles Shultz) airport has wealth of Charlie Brow references, The BUFIT TWO departure is an ode to jimmy buffett, PAROT,PYRAT,JIMME, etc. I believe that HUBUT off KSBA is named for a burger joint down the street from the airport. San Diego has two great departures.